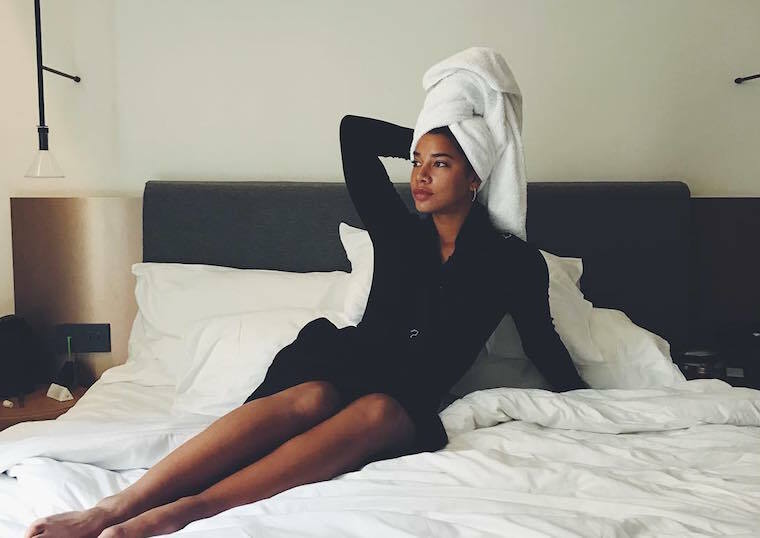 If you follow Hannah Bronfman on social media, you know that the DJ-model-HBFit founder loves clean beauty. She often documents her swoon-worthy top shelf, her on-the-go skin-care faves, and shows snippets of her regimen—so her enviable radiance isn’t just from her post-workout glow (which she probably experiences at least once a day). She’s also collaborated with CAP Beauty, curating beauty boxes full of her skin-care and wellness obsessions. And in a recent Instagram story, Bronfman shed light on her personal go-tos for when she gets out of the shower. One is Mun Ayour Body Toning Serum ($75), which is a luxe body oil full of Moroccan olive oil, prickly pear, and rosehip for antioxidant-rich full-bod hydration. Then, Bronfman uses In Fiore’s Firmante Elevating Leg Tonic ($135), a stimulating serum specifically made for your legs that has echinacea, fennel, and other plant extracts to boost circulation. With nourishing botanicals like those, it’s no wonder Bronfman’s got that dewy, hydrated look down pat. Bronfman’s also got some love wisdom—read up on her simple tip for a healthy relationship. And these are Bronfman’s workout preferences.